This month has been full of fun and exciting surprises. So many things have happened, and I want to tell you about them all! I don’t even know where to begin… so I’ll just begin with my favorite part: getting to meet more of my Mommy’s family. For years, I’ve been hearing about my Mommy’s human siblings – and a little while back, I got to meet one of Mommy’s brothers – Josh – and his wife, Hannah (…as well as a bunch of other family members). It was a lot of fun to meet all of them! More recently, I also got to meet Mommy’s other brother, D, and his two daughters, Liliana and her little sister, Angelina. Those girls are two of my favorite little humans ever! I felt like I’d known them their entire lives, though, because Mommy has been telling me all about them for as long as I can remember. It was amazing getting to meet them in person for the first time! And they even wore purple because they know that it’s my favorite color! Liliana told me that she’s been eagerly waiting to meet me, too, and I was so flattered to hear that. She’s incredibly smart and knew a lot about horses already. She asked lots of really good questions, too, which Mommy and I love. It was clear that Liliana wanted to learn as much as she could about horses – and we were happy to answer all of her questions! After introducing us, Mommy explained to Liliana and Angelina how to behave and act around horses (no yelling or running, always let us know where you are and watch out for your own feet, because we might not see them… things like that). Then, Mommy grabbed my grooming kit and we all went over to the hitching post so that Mommy could show the girls how to use the brushes. It was so much fun having both of the girls grooming on me at the same time! They learned quickly and did a great job – with my Mommy and their Daddy supervising (and taking lots of photos). Mommy and the girls tacked me up in the most colorful outfit they could put together; four different polos and my new owl saddle pad. I loved it! Mommy knows how much I love to dress in bright colors. D and his girls watched while Mommy and I had a sunset workout. Every time we came around the turn, they cheered my name and clapped to show me what a good job I was doing. It was awesome! (Needless to say, I was on my best behavior… so they clapped a lot!) After we were done with our “serious” work, I begged Mommy to let me walk the girls around… and she said yes! Mommy’s brother, D, said that it was the first time his girls had ridden a horse! We were all very excited. First, Mommy let Angelina sit in the saddle in front of her so that she could keep a hold of her and make sure she was safe while we walked around. Even though I knew that Mommy would hold on tightly to Angelina, I walked as slowly and carefully as I could. I was glad to hear Angelina say that she was having fun, because I was, too! When Angelina’s turn was over, her Daddy helped her out of the saddle – and then Mommy hopped down out of the saddle, too. She fastened the helmet snugly on Liliana’s head – and then explained to her the meaning of a “leg-up” (where Mommy grabs hold of Liliana’s left ankle and helps her up while Liliana jumps as high as she can and swings her right leg over my back) before attempting to give her a leg-up into the saddle. Liliana is very athletic, so she did a good job – even though I’m much taller than her! Liliana and Angelina helped Mommy get my dinner grain ready, and when I was dry I got to go back to my stall and eat. I was sad to say goodbye to them when they had to leave, but Mommy assured me that I would see them again sometime. All in all, I think that was my favorite day (and night) of the entire month. The next morning, Mommy and I had an early ride – and then she left for San Diego with her human parents, not to return again until… the next night. I know, I know; that’s not a very long time. But it was a long time to me! Luckily, my Aunt Bonnie was there to feed me my dinner and let me walk on the hot walker with my friends. When Mommy finally came back home from San Diego, she let me out of my stall to run around and play in the arena. I had a lot of energy! We didn’t have a proper workout that night, though, because it was already supposed to be my day off. The next morning, however, we worked over some raised ground poles – and it was way harder than it seemed! But Mommy said that it’s a good exercise for me to practice, just like all of our ground pole patterns and exercises. Mommy also said that she and Daddy had a discussion about my training schedule, and they decided that I was ready to move up to hourlong workouts each time – just like before the “hot nail incidents!” Mommy and I have been gradually increasing the duration and difficulty level of my workouts in an attempt to get me back into the same kind of shape that I was in before – on my way to the Grand Prix… and I guess this means that I’m right on track! Since moving to California and getting back into the swing of things, I was on a “three-days-on, one-day-off, two-days-on, one-day-off” (3/1/2/1) schedule, with mixed durations. Sometimes I would work for a solid hour, sometimes for a half hour, and sometimes for more or less time (depending on factors such as how well I behaved, or how hard I had worked the day before, etc). Now, I’ll be on a “4/1/3/1” schedule, working for an hour each time! Anyway, enough of that technical mumbo-jumbo… Let’s get to the good part: my second favorite day this month, when Mommy and I jumped a 3’9 oxer with a 3′ spread! And I was even wearing an English Jumping Hackamore, too! Now, although it wasn’t the biggest or the widest oxer I’ve jumped, it’s the first time I’ve jumped an oxer with a considerable spread since getting back into shape. And although I don’t usually like jumping in a jumping hackamore (because I don’t like the way the curb chain feels on my chin when I stretch out over the jump), I didn’t mind it this time. Probably because I was so happy just to be jumping… And I was excited to be jumping a big, wide jump like that, too! I did get new shoes from my friend, Tim the Horseshoer, though! Can you tell that I love my friend, Tim the Horseshoer? Well, although there’s much more to talk about, I think I’ll save the rest for next time. It’s getting late in the day, and Mommy said that we were going to be working this evening – so I’d better go get prepared for a workout! I hope you’re all are staying cool in this heat, friends. I’ll catch y’all later! Have I mentioned lately how much I love my life? Although I do work very hard, the work I do is mostly fun – and I get to hang out with my Mommy and all of my friends just as much, if not more. I’m never lonely because there’s always a friend or two somewhere nearby. And now, thanks to my wonderful Aunt Bonnie and my best friend, Chief, I have a toy in my stall that I can play with when I’m hanging out and waiting for Mommy to come back! Aunt Bonnie brought a big orange cone for Chief, but he didn’t seem to want it… And, because Chief knows how much I love to play with the cone in the arena, he asked his Mommy to give it me! I like to play with my cone during the day when I’m bored, after Mommy and I have already worked, before she comes back for an evening visit… But it’s also fun to play with my cone at night before I hit the shavings! I’ll be forever grateful to Chief and his Mommy, my Aunt Bonnie. They spoil me so much! And I even got a tail bag! This is the first tail bag that I’ve ever had, and I really love it. But I didn’t know what to make of it at first! Right after Mommy put it on me, I tried to swat away some flies with my tail – and I seriously thought that someone was smacking me with something! I kept testing it out, and I kept getting spooked when I’d hit myself in the side with the tail bag. For the life of me, I could not understand why someone would smack me just for swatting away flies… and I had no idea who was doing it, either – because I could see Mommy standing right next to me! Of course, she was laughing, and I did not find the situation very funny. Finally, Mommy grabbed the tail bag and pulled it as close to my face as she could to show me that it was actually attached to my tail. When I found out that I had been spooking at my own tail, I felt pretty silly – but that feeling didn’t last too long. The wheels in my head began to turn, and I realized something very important: the tail bag was much longer than my actual tail. You might be wondering why that matters – and I will gladly tell you. With a tail bag much longer than my actual tail, I can swat away flies that I otherwise wouldn’t be able to reach! I can even swat them off of my shoulders if I aim well enough! It’s absolutely heavenly… especially because I have great aim! Anyway, the presents didn’t stop there. Mommy and her Mommy also bought me some brand new saddle pads. Our unanimous favorite is the one with cute little owls on it! Mommy loves owls. I’ve never seen one in real life, but if they’re as cute in real life as they are on the saddle pad, then I definitely want to be their friend. In addition to the favorite owl pad, I got a bright blue saddle pad, a bright pink one and one with a black-and-white pattern on it to match the fancy saddle bag that Mommy got before she and I moved out here. Mommy also got me five different pairs of boots, all of which I love (but some of which I love more than others). Those aren’t all of them, but those ones are my favorites. (And, of course, I won’t wear a different boot on each leg while I work, like I do sometimes with colorful polos… I’ll probably only wear matching sets. But you never know!) It just figures that the boots I love the most are the ones Mommy wants to save only for special occasions… like jumping day! That’s right, you guessed it: I got to jump on Friday! (And yes, I wore my brand new boots and one of my brand new saddle pads!) But I knew it was jumping day before I was even tacked up… because Mommy gave me marshmallows, my super-special jumping day treat! After warming up on the flat and then over some small jumps, Mommy and I worked through a line that consisted of three jumps. The first two jumps didn’t have a stride in between (which is called a “bounce”). That means that I land from the first jump and immediately jump the second one. The second to third jump had one single stride in between. So it was a “bounce to a one-stride” line. It was only a little bit tricky, but a lot of fun. Every time we jumped through the line successfully, Mommy would raise the jumps up a little higher. Eventually, the last jump was set to three and a half feet, which is the highest I’d jumped since getting to California and getting back into shape. Once that last jump was set at 3’6, it was definitely much more difficult… but nothing that Mommy and I couldn’t handle. When Mommy had determined that I’d jumped through the line enough times – and praised me profusely for being such a good boy – she decided that I deserved another reward. Mommy knows how much I love to jump really high, so my reward was getting to jump a four-foot-high oxer! Mommy moved two of the jumps from the line together to make an oxer and took the last jump out completely. As we cantered around the turn and started our approach to the jump, I could feel Mommy’s heart pounding and realized that she was a little bit nervous! Even though I wasn’t nervous at all, I understood why Mommy was. It had been about a year since we’d jumped anything nearly that big, and Mommy must have been feeling a lot of emotions. First of all, I know she was nervous just because it’s been so long since she has jumped that big, too, but she was also probably really scared that I’d hurt myself and have to take time off again. I didn’t want her to be nervous that I would refuse the jump or knock it down, in addition to all of the other things she was feeling, so I made sure to canter up to it with confidence. I wanted her to know that I would take care of her, but I also wanted her to know that I was ready for this! It was a piece of carrot cake. I didn’t even have to try very hard to jump over it! Mommy told me later that she asked me to go a little too fast on the approach because she was nervous, and she also joked that she was “hiding” in my mane while we were in the air! I assured her that she did a very good job during her first time jumping four feet since last summer… and she assured me of the same thing! She told me about a thousand times how proud of me she was… and, of course, I got more marshmallows afterward as a special treat. Anyway, I know I sometimes complain about the hard work that I have to do in order to get back into shape (…especially about the exercises from that “101 Jumping Exercises” book that Mommy loves to practice), but I really do have to admit that the hard work is paying off! Mommy said that if I keep working this hard and doing such a great job, she thinks we will be jumping five feet again in a matter of mere months! I know that we can do it. I can hardly wait! One of the things that I love the most about California – as I know I’ve mentioned before – is how friendly and outgoing everyone is here, and how easy it is to make friends! You see, I’ve always been able to make friends with humans pretty easily, being that I’m super lovable and sweet (and handsome and charming) (and modest!). Most of the horses I’ve met have ended up wanting to be my friends, too… except for the ones who had a major chip on their withers (which honestly haven’t been that many). I’ve even made friends with some dogs – like Annie, the dog I became friends with when I lived at my Aunt Joyce’s house in New York. Anyway, I’m sure most of you remember Rocky the Kitty, right? He was a kitty that I became friends with in Tennessee. He was shy and a little nervous at first, but we quickly became buddies. The only bad part about my friendship with Rocky was that he didn’t like to hug or cuddle – and I love to hug and cuddle. Then, when I moved out here to California, I became friends with a kitty named Olive and also with her barn-sister, a kitty named Becky. They’re both wonderful and love to hang out with Mommy and me. But I have finally met a kitty who takes the entire carrot-cake. She’s probably my best kitty friend in the whole world, and I’ve barely known her a single day! Yesterday, while Mommy and I were working, we noticed that we had an audience. So, when it was time to take a break, we went over to say hello. Princess gave me the warmest, friendliest hello of any kitty I’ve ever met before. She gave me a “kitty hug” before I’d even had a chance to introduce myself! Well, hello there, Princess! It’s nice to finally meet you up close! Mommy leaned down to pet Princess and say hello, too, and then Princess did something completely unexpected. She climbed right up into Mommy’s lap… on my back! I stood really still, because I didn’t want to scare her – but I should have known better. Any Princess who is brave enough to climb onto a horse’s back is clearly fearless! Anyway, Princess was apparently so happy to be sitting on my back that she decided to take a nap. That was fine with me, though, because it meant that I could take a longer break and just hang out, eating grass over the wall! You just sleep as loooong as you want to, Princess! Mommy thought it was absolutely hysterical that Princess just jumped up into her lap while she was on my back, but I thought it was really cool. I knew that Princess and I would be best friends forever! Now THAT is a happy kitty! Eventually, Mommy told Princess that she’d either have to ride double with us while I finished my workout, or that she would have to get back down and watch from the sidelines. After a few more cuddles and a big hug (and head-scratchies from Mommy, which made Princess purr even louder), my newest kitty friend hopped back down onto the wall and wandered off to catch some mice, or sleep in the sunshine, or whatever it is that Princesses do in their free time. Yep, I think I’m really going to love it here in California… In fact, I already do! That’s about all I’ve got for you today, friends. I’ll continue to keep you updated on my California adventures; I’m sure there are many more to come. Catch y’all later! Well, I’ve been living in California for almost three weeks now, and I think it’s about time for me to report on what I’ve learned. This time of year, the nights get chilly (but not quite “Tennessee-cold”) and the days get hot rather quickly. Psyllium, although I haven’t had any yet, is definitely a necessity here because there is a lot of sand – and Mommy told me that Psyllium will help to clean out the sand from inside my belly. The Alfalfa hay here in California is like candy, it’s so delicious. Palm trees look neat, but I can’t really form an opinion on them until I’ve had a chance to taste them… which I don’t think will ever happen, because they’re all really tall. I’ve been getting into a pretty good routine here, but I know it’s probably going to change a few times. For now, though, I get to see Mommy twice a day (every day!) and I’ve already made a few friends, like I mentioned before. The best part is that I’ve made friends with a fairly wide range of species, including horses, cats and humans. And friends are the most important ingredient in the recipe of life… that is, aside from family! The first friends I made, of course, were Ringo and Chip – but Chip actually moved on to a different barn to become a dressage superstar. From what he told me, he loves dressage and was pretty excited to pursue his passion. I’m happy for him, but I do miss him. I didn’t get a chance to miss him for long, however, before a new friend moved in. This sweet, older mare named Splash now lives next to me in Chip’s old stall. (She’s the one who told me at first that she didn’t want to be my friend.) When I came over to say hello to her the day she moved in, she pinned her ears and squealed at me like I’d done something wrong. Of course, I’ve gotten that reaction from horses before (though not very often – I’m much too lovable for that), so I wasn’t really phased by it. I simply gave her a minute and then tried another tactic. I very casually told her how my Mommy loves to share my treats with my friends (and there are always lots of treats to be shared), so friendship with me definitely had a couple upsides. After a moment’s contemplation, Splash said that she’d give me a trial period. But the first time Mommy came through with carrots for everyone, Splash realized that I hadn’t been fibbing – and I think it solidified our new friendship instantly. Now, after I’ve been out of my stall for a while, she even whinnies to me when I come back! On the other side of Splash is a pretty little gray mare named Sally. I met Sally one day when she was running around in the arena and showing off how beautifully she moves. Mommy wanted to go for a walk, but I was too captivated by Sally; I just wanted to stay and watch her dance! Sally’s human is named Elizabeth. She and her Mommy, Shelley, are two of my other new friends. They’re both very sweet and always say hello when they see me. Shelley is also a trainer at my barn! Khalid, I think you’re my new best friend. Seriously, dude… Do you want me to take that off for you? Two more human friends I’ve made are Bernie and Lou. They are so nice! They always bring carrots and give everyone some as a special treat. I haven’t really made friends with their horses, Lady and Whisky, but I know I’m going to. Lady is also a retired racehorse – just like me! But she squeals at me when I try to come over to her and say hello, so I don’t want to make her uncomfortable. I know she’ll warm up to me one day soon, and then I’ll be able to make friends with Whisky, as well! I love you, Aunt Bonnie! Anyway, I didn’t tell you about my Aunt Bonnie yet, or about her boy, Chief. My Aunt Bonnie is the one who spoils me the most (aside from my Mommy, of course). I love her! She’s always bringing me over treats and little buckets filled with the most delicious hay pellets. I mean, you’d think they’d be boring because they’re just hay made into pellets, right? Wrong! They’re scrumptious and I love eating them! Mommy said that they give me green lipstick, but I don’t mind – especially because Mommy said green lipstick looks good on me. (How could it not? Everything looks good on me!) I try to let my Aunt Bonnie know how much I appreciate her by giving her lots of kisses (without the lipstick). But I think she probably already knows that I love her. After all… she’s my Aunt Bonnie! Now, I know I’ve told you about my kitty friend, Olive. (She’s the one who came over and hung out with me while I worked and then even stayed to graze with me afterward.) 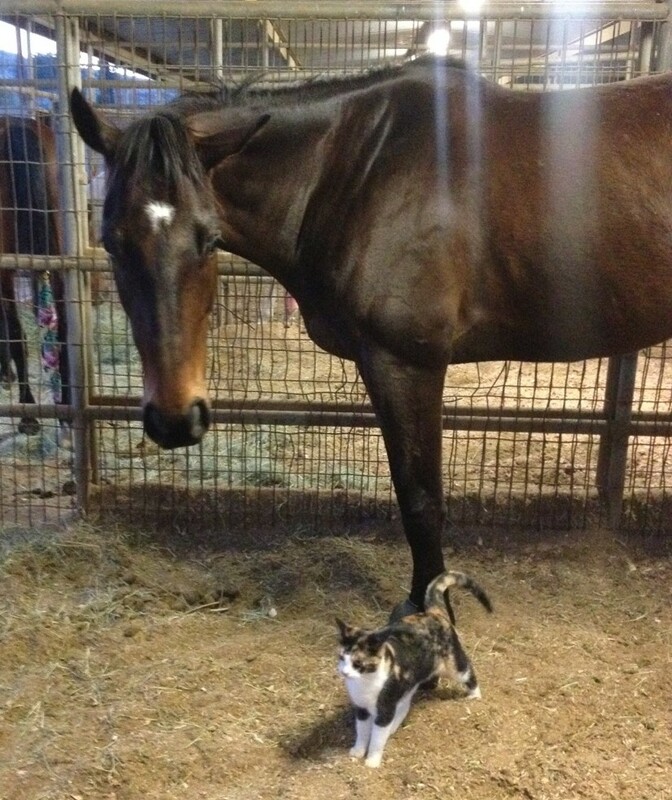 But I’ve made more than just one kitty friend; there are so many cats at this barn who love to be around us horses! That makes me pretty happy. Y’all know how much I love making friends, big and small. So, aside from Olive, my next best-kitty-friend is Becky. She’s a pretty little Calico cat and she loves to hang out with me, whatever I’m doing. She even comes into my stall and cuddles with me sometimes while Mommy grooms on me. When she’s hanging out with me, I try to stand really still so I don’t accidentally step on her or scare her – but she seems to be very familiar with horses and knows when to get out of the way. She’s so fast! She can jump so high! And, from what I hear, she’s a really good hunter, too. Becky likes to rub her body and her tail against me, and Mommy told me that’s like giving a hug in kitty language. I love hugs; I’ll take all the hugs I can get! My special little friend, Becky. There are a couple other kitties at the barn who I don’t know that well yet, but they still like to come and hang out with me. Sometimes they even watch me work in the mornings, which is awesome, because – as anyone who knows me knows – I love having an audience. It’s nice when my friends come and watch me work because it gives me a chance to show off a little bit – even when it’s just a group of my kitty friends. Having anyone there, though, gives me confidence and makes me want to work even harder than I already do! A lot of the time, on a hot, sunny day, I see the kitties sitting together on the patio of the show barn. They’re all such good friends; it makes me happy to see them enjoying their life. These lucky cats get to roam around the property during the day, making friends and hanging out with humans and horses and each other – and sometimes even catching the mice and rats who like to try to steal our grain. And then, at night, they get to sleep indoors, safe from all of the scary animals who lurk in the darkness at night, just waiting to catch a small kitty for a midnight snack. It’s clear that their humans give them the best of everything… just like my own humans do for me! Now, in case you were starting to think that my life mainly consists of hanging out and making friends… well, I guess that’s actually true. But I do still work very hard on a(n almost) daily basis. As many of you know, it’s my goal to become a “Grand Prix Jumper” someday in the very near future, and that means that I have to practice and get into the best shape of my life! Last year, I had a lot of time off because of a couple misplaced nails in my shoes, and then the winter in Tennessee was cold and rainy and snowy – so I arrived in California with very little muscle and even less stamina, because it had been so long since I’d had a consistent workout schedule. But that all changed the day I arrived in Sunny SoCal. It was time to get into shape and start really working toward my goals! Mommy said that she was out of shape too, though, so we would be able to get into shape together. Mommy and I have both been working very hard. We don’t work more than 4 or 5 days each week, though – and never 5 days in a row – because Mommy feels that resting after a hard workout is just as important as the workout itself. She doesn’t want me to get degenerative joint disease, which is a real possibility for horses who work as hard as I do! So the days of rest give my muscles and joints a chance to repair themselves, which in turn makes me even stronger. Of course, “a day of rest” doesn’t mean that I just sit in my stall all day, bored and unfulfilled. Sometimes it means I get to go for a long walk around the property with Mommy, saying hello to all of the friends I’ve made. And it usually means that I get turned out in the arena, where I get to run and play and roll and buck as much as I want to! Mommy doesn’t chase me or make me run on my days off; I only run if I want to, but I almost always buck and roll and take some time to act silly! My workouts have been getting increasingly more difficult since landing here in California. We started out with light, easy workouts, just aiming to get back into the swing of things. At first, that was plenty; I was out of breath after a twenty minute workout… and so was Mommy. But we’ve been increasing the length and intensity of our workouts as we both get into better shape. We work out at all different times of the day, too. Most of the time we ride mid-morning, but sometimes Mommy rides in the evening – and sometimes, we get up before the sun even peeks out over the hills of the canyon where we live! Because I’ve been working so hard and trying my best to focus and behave every time Mommy and I ride, I got rewarded by getting to jump a little bit! The jump was really small, though, and it made me frustrated because I miss jumping BIG jumps! I mean, I used to jump five feet high, before the “hot nail incidents,” so why can’t I just go back to jumping five feet again right now?! Well, I found out the answer to that after jumping a little, tiny jump a few times in a row: I was sore! Even though the jump was small, I was using muscles that I hadn’t used in a while. Then I understood why Mommy was torturing me by making me jump something that seemed too small to be worth the effort. She knew I’d be sore the next day, and she wants to make sure that I work my way back up to those big jumps slowly. She even gave me a liniment bath afterward and wrapped my legs in standing wraps, which I was pretty happy about, because it helped keep my legs from “stocking up,” or getting swollen, when I went back to my stall. After another week’s worth of flat work, Mommy decided that I deserved another day of fun. So one morning, instead of riding me and doing our normal workout, Mommy turned me out in the arena and let me gallop around. Then, to my surprise, she set up a small jump and let me go over it by myself, without her on my back! It’s been a long time since I’ve “free jumped,” and it was a lot of fun. Mommy actually ended up putting me on the lunge line, though, because she didn’t want me wasting too much energy by galloping all around the huge arena after each jump; she knew I’d be tired and sore enough just from jumping. I had so much fun! I even got to jump a small oxer! Mommy let me jump as many times as I wanted to, until I was so tired that I could only trot over the jump. I wanted to keep jumping, even at a trot, but Mommy said that it was probably enough for the day. Because I had worked so hard and I was so tired after free jumping, Mommy decided that I should walk on the hot-walker. Of course, she let me walk around in the arena first (and roll, because I was itchy and sweaty), but she wanted to make sure that I walked enough, so that I wouldn’t tie up or colic or get really, really sore. After walking on the hot-walker for a while, Mommy gave me a liniment bath and wrapped my legs in standing wraps again, too. Then we got to hang out and graze for a while before I went back to my stall and took a long nap! I’m usually pretty exhausted after my workouts, but it’s a good feeling because it means that I’m officially back in the game! Today I got two extra special treats. Not only did Mommy’s human parents come to see me, which was really exciting and fun, but they also brought me a scrumptious carrot cake cupcake with delicious cream cheese frosting that Mommy’s sister-in-law made for Easter! At first, I didn’t know what to make of it and I accidentally spat it out. But then I regretted that immediately! Mommy picked it up and took the dirt off of it before giving it back to me, and then I gobbled it up! Actually, those weren’t even the only two special treats that I got today. While Mommy and I were working in the lower arena, I was trying to be on my best behavior and show off a little for her parents (because, as I’ve said, I love having an audience). Since I was being such a good boy, Mommy decided that I would get to jump a little bit today, too! That made me very happy, not only because I love jumping, but because it meant I’d have a chance to show off a little bit more for “my audience!” We still only jumped a small jump – but it was still a lot of fun. And since I’d gotten to free jump a few days before, I didn’t feel the need to rush or get silly when I was jumping today! Mommy was very proud of me and I could tell that her human parents were, too! Mommy said that the most important thing right now – in regard to jumping, anyway – is that I stay calm and listen to her, instead of getting excited and trying to rush over the jump or take control. She promised me that I’d get to move up to bigger jumps pretty soon, as long as I keep working hard on my flatwork and grid work, and focus on everything she asks me to do. She assured me that even the boring exercises have a purpose; if I try my best, even at the exercises that I don’t particularly enjoy, then I’ll be back into shape and ready to start jumping courses again in no time! Then again, I’m sure that “no time” means something different to her than what it means to me… I have to admit, though, I really don’t mind working hard when Mommy and I ride because she gives me lots of love and attention, and she allows me to have a lot of fun, too. I mean, I wouldn’t have been able to make as many friends as I have if she didn’t come to the barn to spend so much time with me and make sure that I’m not bored and lonely. She also promised that we’ll get to go out for a trail ride soon so that I don’t have to be in the arena all of the time. Although, I must say, having three arenas to work in makes the arena work much more interesting! Anyway, I’m sure there’s more that I could tell you – as always – but I’m about ready to hit the shavings and get some sleep. So I’ll catch y’all later! This is just too exciting not to post. I don’t mean to brag (even though I know I brag all the time, because, well… I’m awesome! ), but my human and I were featured on New Vocations Racehorse Adoption Program‘s Facebook page! They posted a photo of us jumping five feet on their Facebook page to show people that small horses can still do anything that big horses can do, as long as they have a good human and a big heart! Friends, this just goes to show you that you can do anything if you put your mind to it. When I left the racetrack all those many years ago, I was certain that my failures on the track would mean a one-way ticket to the livestock auction, which would almost definitely mean death for a scrawny little guy like me! But I was rescued by a wonderful woman named Phyllis Dawson, and soon after that, I was adopted by my Mommy and Daddy. Even though I wasn’t adopted through the “New Vocations Racehorse Adoption Program,” I still feel like I was absolutely one of the lucky ones. And I have all the respect in the world for “New Vocations,” because they’re dedicated to helping all of my friends and relatives find a new life after they are done racing. “New Vocations Racehorse Adoption Program was founded in 1992 to offer retiring racehorses a safe-haven, rehabilitation, and continued education through placement in experienced, caring homes. Most of the horses arriving at New Vocations are injured and thin, suffering the normal occupational hazards of racing. Without a useful skill to offer, their previous option was often a one-way ticket to the local livestock auction. New Vocations provides a safety net for these horses, matching them with qualified individuals and following up on their rehabilitation and vocational training to ensure a successful transition. 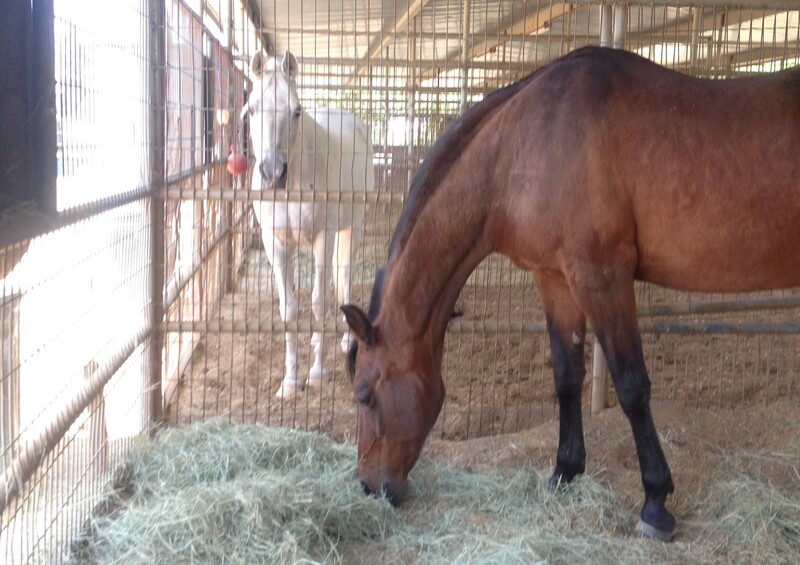 Our focus is on adoption versus retirement, believing that each horse deserves to have an individual home and purpose. Thank you, New Vocations, for giving me such amazing and heartfelt encouragement. Mommy and I are ecstatic, and we really appreciate all the work you do to rescue, rehabilitate, and re-home Thoroughbreds and Standardbreds after their racing careers are over! Well, that’s about all I have to say for now, y’all. Thanks for sharing in my excitement, friends, and remember: you can do anything if you put your mind to it! And don’t forget to tell your humans about New Vocations, so they can spread the word to any of their human friends who are looking to change the life of a lucky horse in need of a second chance. Heaven in a Hay Roll! Y’all, I just have to go on a little rant about how awesome my life is. I’m in heaven! It may be freezing outside, but life couldn’t be better. Just when I was beginning to wonder what my friends and I were going to do when the grass in our paddock was all eaten up, my Auntie Carrie brought us a GIGANTIC HAY ROLL! I’ve never seen a stack of hay this big before. It’s amazing! Hey, Mommy! Look at what I have! When Mommy arrived at the barn the day the hay roll got here, she came out to the paddock to bring me in for some quality time. I walked over to the gate, eager to show her the best part of my day. Once she put my halter on, I turned and brought her over to the biggest pile of hay in the world… and took a huge bite! She laughed and said she was happy for me… but not nearly as happy as I was! Yum! I love my life! When it’s cold outside, and especially when it’s cold and windy and there’s no shelter, it’s really important that we horses have a way to keep warm – aside from wearing our winter jackets. Eating is a great way to help us keep our body temperatures up, but in the winter when there’s no grass, we need a little assistance from our humans. That’s why my Auntie Carrie got a hay roll for each paddock! I love my life and I love my home. I also love being in the paddock with Lewis, Doc, Rudy and Canuck. It’s like having my own little herd! We’re all friends, and I just do what everyone else tells me to do. We all take turns eating the giant hay roll, and when we’re full, we take a nap in the sunshine with our warm blankets on. I could just stand and eat at the hay all day long. Since it’s been below freezing for the past several days, Mommy and I haven’t been able to do any work. In fact, Mommy has barely been out to see me at all! Now, don’t get me wrong; she or Daddy (or both of them) come to see me every day, but lately they haven’t been staying very long. Mommy showed up in the middle of the day yesterday, and she didn’t even bring me out of the paddock! She just picked my feet as I was eating my hay pile in the paddock, gave me kisses and hugs and then ran back to the warm truck. I don’t blame her, though; the wind was pretty strong, and she doesn’t even have a layer of fur underneath her human clothes, like I have underneath my blanket! I guess that’s about all I have to say for now, friends. I’m heading inside for the night, and I think my dinner grain will be ready soon. So I’m going to eat dinner, munch on some hay, and fall asleep in the warm, cozy barn next to all my friends. I hope y’all stay warm and have a great weekend! It’s been nice having Mommy back home, and even nicer having days warm enough (and dry enough) to actually ride! Yesterday was rainy and wet, but the day before – and also today – Mommy and I got to ride in the arena. We were both happy to be out in the open! We didn’t even care that it was cold; we were just so eager to get back to work. Heading out to the arena! Even though I’ve had a lot of pent-up energy from being stuck in the barn for days (due to inclement weather), I made sure to focus on everything Mommy asked me to do. I wanted to be on my best behavior, because I don’t know whether or not it’s going to rain again soon, and I’d rather put in a good, happy, fun ride than to go crazy and get Mommy upset. When I’m well behaved, Mommy brings peppermint candies out with her and keeps them in the zipper pocket of her heavy jacket. When I do what she asks me to without a fuss, she gives me a peppermint and makes a big fuss about me. The other day, she dropped one of the peppermints as she was trying to hand it to me. But I had been such a good boy that she simply couldn’t let the treat go to waste. So she dismounted and grabbed the peppermint candy for me. She wiped it off and told me she would give it to me if I posed for a photo. Yeah, I know; I’m a little bit muddy… I rolled RIGHT before Mommy got to the farm! Of course, I love posing for photos. Everyone knows that. But I got a treat for it, anyway! After our ride today, Mommy told Daddy that I was perfect. I even did lead changes every two strides down the middle of the dressage area in the huge arena! I knew exactly what Mommy wanted me to do, and she told me it was like I was reading her mind. All she had to do was shift her weight and I hopped over to the other lead. She didn’t even have to count for me after the first time! I know for a fact that I made Mommy so proud! I got to visit with my good friend, Baby George, after my workout. He told me that I did a good job; he’d been watching my entire workout while he grazed with his pony friend, Gideon. Baby George is awesome. He and I are becoming good friends. I like to hang out with him after I work, or when I’m grazing with one of my humans. He’s the only horse in the barn who always whinnies to me when he sees me coming! It makes me feel really special. Mommy shares pieces of my peppermint treats with Baby George sometimes, to reward him for letting her pet him and scratch his belly and things like that. I don’t even mind sharing my treats with him! He’s still a little shy, but he is now well aware of the joy of peppermint candies, so he’s learning to like humans much more all the time! Auntie Carrie is training him to be smart and friendly. I bet he’s going to be an amazing pony when he grows up! Anyway, Mommy said this entire week is supposed to be warm, and that means that we’ll actually (hopefully) get in a whole week’s worth of workouts! (Whew, say that one three times fast!) I’ll let you know what happens… I’m hoping that there’s a jumping day on the horizon soon! Stay warm, friends… catch y’all later! Wow, has it been that long already? I guess there’s just been too much going on, I can’t keep up with all of it! So, you remember my new friend Anthony, right? Well, he came back to the barn again for a second riding lesson the next day, and he actually learned how to canter! In fact, he did such a great job in his lesson that my Mommy and I decided that he could sit on my back and trot around a little bit after our workout – that very same day! That’s my friend Anthony and me trotting around! Anthony did a really good job. He even asked me to come into a frame without realizing it! Are you asking me to come into a frame? Because I will, gladly! We had a lot of fun, especially when we got to the part where we posed for photos. You know how much I love posing for photos! It took me a while to come out of my haze, but Mommy stayed with me the entire time and made sure I was alright. Anyway, the other day, I was in the paddock next to Pokey and Ella’s paddock when they both left to go to their lessons, leaving me completely alone. Well, I kind of panicked. I started running around like crazy, which was not a smart idea, seeing as how all of the paddocks are on a hill. One of the people at the barn saw me running and brought me into my stall, where I calmed down, but I was sweaty and hot and my legs were already sore, even though I had been wearing my turn-out boots. Needless to say, the next day, all of my legs were very swollen. Mommy thought I was just stocked up at first, but she said she was just going to prepare herself for the worst. She cold-hosed my legs, and then she let me stretch and get my sillies out in the round pen to see if the swelling would go down. I shouldn’t have been running in a paddock that’s on a slanted hill like that; I’ve learned my lesson, but I can’t promise that I won’t do it again! The swelling in my legs has been gradually going away, but I’ve had to have even more time off since then, and it’s driving me crazy. Mommy has been by twice each day to cold-hose my legs and wrap them in standing wraps. It was way too hot today to go outside, but I heard a rumor that I’ll be going into the little medical paddocks again, since they’re much smaller… and that means it’s much harder for me to gallop in them! I’m not happy about it, though; I’d rather be eating grass all day. I guess I should have heeded Mommy’s warning when she told me that I’d better not gallop in the paddock! I have a feeling I’ll be getting tomorrow off, too, but if it’s as hot tomorrow as it was today, I won’t mind one bit. I guess that’s all I have to say for today, friends. I’ll catch y’all later… Stay cool and drink lots of water! Okay, I know it’s been a while, but there’s been a lot going on! I’m a busy horse these days, you know. I’ve been making friends all over the place! A few nights ago, Mommy showed up at the barn super late in the evening with a friend of hers. It was so late, I’d already eaten my dinner grain and half of my night hay, and I was taking a nap when they arrived! Mommy said her friend’s name was Ashley, and that she’d known Ashley for a long time. I could tell that Ashley was a horsewoman, because she walked right up to me and began petting my face and scratching behind my ears! Ashley lives in Washington D.C. and came to Nashville just to meet me! And last night, I met another one of Mommy’s friends. Apparently, she’s known this guy even longer than she’s known my friend, Ashley! His name is Anthony, and he immediately won me over when he gave me some treats! Mmm, molasses cookies – my favorite!! Anthony lives in California and also in Dallas. I’ve never been to either of those places, but Anthony said that I’d probably like them both. And you know what? He came to Nashville just to see me! Anyway, I thought that Anthony was going to watch Mommy and me ride, but as it turned out, he was there to take a riding lesson, himself! That’s Jenna giving Anthony a lesson on Sonny! He did a great job, and he’s going to take another lesson tomorrow. I had today off, though I didn’t mind it one bit. I got to go outside into a paddock with lots of grass while Anthony had his riding lesson, and I was happy to come in when they were done. It was hot today! And the flies were biting me non-stop! Wow, this grass looks delicious! You see, the reason I had today off is because I banged my ankle when I was being silly in my stall, and it was swollen today when Mommy got there. She wanted me to go out for a little while in order to help with the circulation, but she didn’t want me to stay out too long because she knew I would probably end up hurting myself… again. When I went back inside, Mommy told me that I’d better not have any more bumps or bruises when she came back again to check on me! She told me that if I didn’t, and I was all in one sound piece, I would get to actually do some work tomorrow! That’s about all I have to say for today, friends. Stay out of the heat and make sure you have lots of water to drink! I’ll catch y’all later!